My return to the Melbourne breakfast scene took me to a part of Clifton Hill that was both familiar and strange to me, depending on which side of Queens Parade we look at. The familiar aspect of this northern arterial road lies to the East in the form of the bizarrely architectural Clifton Hill McDonalds (I do love art deco, and a sneaky caramel sundae). The Clifton Hill Mac drive-thru and car park has served as the setting for at least two firsts for me – my first desperate car-knock for jumper leads to start a flat battery caused by eating sundaes with the headlights and radio on; and my first encounter with a brothel (to eat, we always park out the front of Scarlet Lady or “Scarly”, the other den of iniquity apart from the McDonalds). I had so far overlooked the West side of Queens Parade as it tends to go by in a blur of frantic U-turning across this busy road in order to make it back home. Having the opportunity to actually walk on this side of the road revealed a pleasant strip characterised by many bikes, a quaint little florist and Mixed Business, the cafe where I was meeting the world-beating Madame Macchiato for a final breakfast before she jets off to study disease in a foreign land. Mixed Business has a clean, raw retro feel. The decor appealed to the obsessive in me with a pervasive neatness in the arrangement of the crockery, baskets and cafe knick-knacks on the simple timber shelving adorning the wall behind the counter. Even the plants had a simple neatness of growth and arrangement that made my brain very pleased to look at (and some people call me highly strung – I don’t see it). Finally, and I don’t often mention this, but the staff were as warm and friendly as a sunflower tablecloth (which was not present here, probably for the best – too much of a good thing etc etc). The almost UFO-sighting quality of this image belies the excellence of what my eyes actually registered (though this is less blurry than what my unaided vision would have picked up so let’s just say I was trying to convey “frustration of myopia” with this one). You don’t need 20/20 vision, however, to appreciate the deliciousness of this muesli. Mixed Business have got it right, from the creamy yoghurt used as a medium to convey a subtle hint of rosewater and honey sweetness into the power combination of pistachios, coconut and oats. The strawberries add a refreshing coolness and berry-ness to the mix that complimented the heavier smokiness of the nuts. And as you can see, Mixed Business did not skimp on the nuts which to me conveys a customer-care at a level beyond friendly service. The staff can be as accommodating as can be, but if at the end of the day my mouth has been largely devoid of nuts, I will be going home disappointed (a mentality that surely must be shared by patrons of one of the above-mentioned establishments). To top it off, having the liberty of tailoring the viscosity of the muesli with a separate milk jug is a thoughtful addition to this breakfast experience. Final Word: Queens Parade has much more to offer than the late night Maccas run. 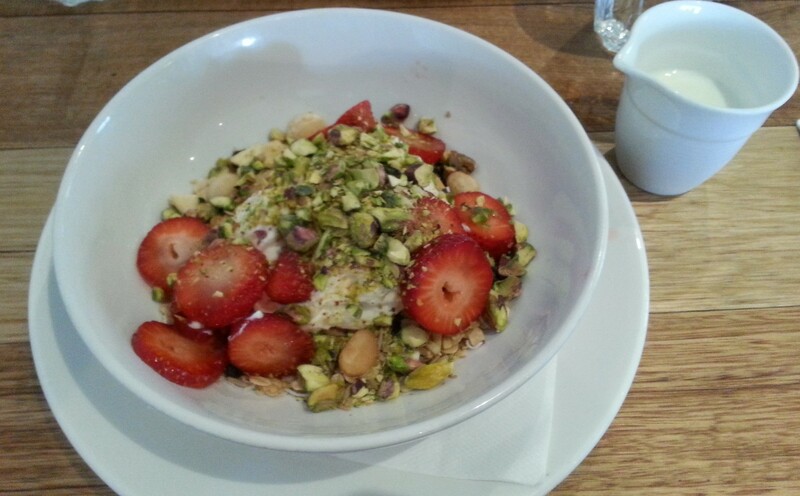 Wake up, walk to the other side of the road and have the good people at Mixed Business fix you this muesli. Caution: they do not have a drive-thru, so you will have to wear pants.